Visions of a winter vegetable garden. Every year we look forward to growing a big bed of broad beans, sown in May. Broad beans have many attractive features – height, lush foliage, flowers, and eventually fur-lined pods containing the protein-packed beans. In most years, broad beans will grow through winter without much supplementary watering either. 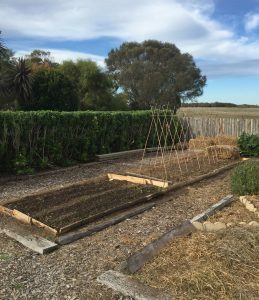 So during April this year, I prepared a bed in the vegetable garden ready for the beans. Blood and bone was dug in, the soil cultivated, and the packets of seeds were readied. When there was no rain during May, I thought maybe a sowing of beans could still occur in the early weeks of June. Alas, still no rain. 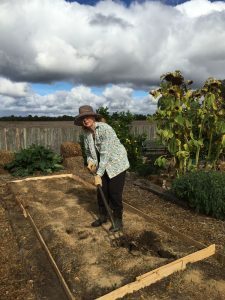 In the meantime, I’ve planted some rows of red onion seedlings, and also sown some English spinach – a vegetable which thrives in cold conditions. Just as well, as we’ve had a series of frosty mornings, with bird baths and water bowls frozen over. Now that the winter solstice has passed, I’ve abandoned my hopes for sowing broad beans this year, as they require quite a long growing season. Instead, inspired by an article in a British gardening magazine, my daughter helped me set up a trellis for climbing peas. I’m using the bed previously prepared for the broad beans, so with the groundwork done, we had the fun part of erecting the trellis with bamboo canes and jute. The sowing of the peas can be done as soon as it rains! 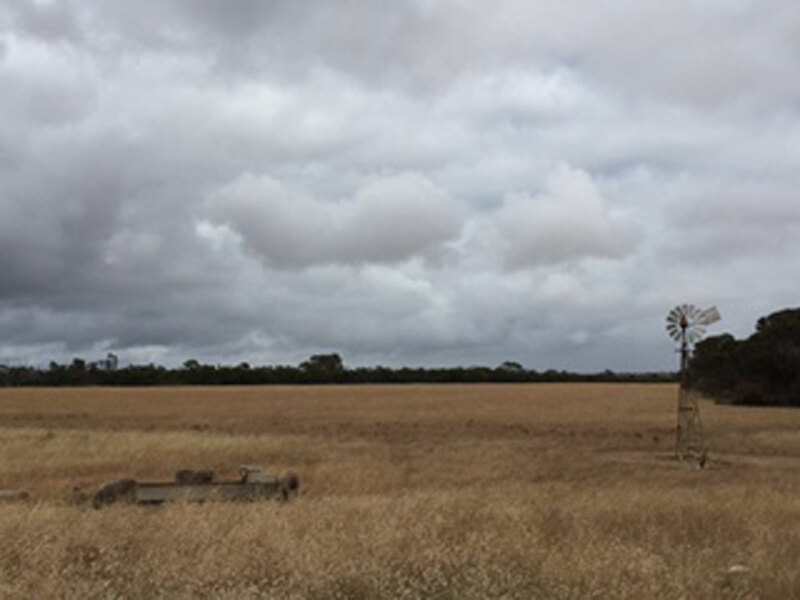 Gary Bouma, Professor of Sociology at Monash University, has written that ‘hope is an essential ingredient for the functioning of societies’ – and that hope is never more obvious than now, in our farming communities – as we all wait for rain.